Aakanksha, notes! : What's Next ? Things gradually change & before we realize it, they become the new in-things & few are history already.A friend recently updated on FB that "We are the generation who prefer texting/calling while standing in front of door to let you know that we have arrived instead of actually ringing the bell at that time", couldn't agree less.With almost everything just a click away from friends, discussions, books, games, shopping portals, to "you name it!" things at business of course need to change & the early bird definitely catches the worm here too. A similar change was very well noticed by marketers & was well identified by Google's MD & leader in advertising business, Jim Lecinski who published an e-book on ZMOT - Zero Moment of Truth. In his book, Lecinski identifies how a customer decides on for his product even before he visits the store. A step ahead of FMOT (First moment of truth), where the brands fight each other on the shelf of a store. We all are familiar with this.We all have been there, googled for the reviews of the latest flick released at Rotten Tomatoes before booking the tickets , or compared bikes, electronic products, even hairstyles etcetera at Naaptol or Mouthsut & finalized things on CNET Review before we even have a look at the actual thing at the stores & guess what our experience says it works even better this way, especially when the choices with the consumers are never ending. Looking at all this, it definitely makes sense for the marketers to shift their focus at this side of the ground where their products now compete. In his very well written book Lecinski perfectly describes this concept & clears many misconceptions like how ZMOT can be applicable to any industry, or any segment of people, or from start-ups to the well established houses & many more such things which makes it an intriguing read. 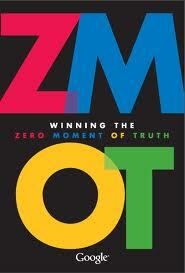 Click here for the pdf of the book "ZMOT". ZMOT is intriguing for marketers in this technology savvy world.